New York City Mayor Bill de Blasio recently announced a $23 million investment to install solar panels on 24 public schools by 2016 as part of his One City, Built to Last green building plan to develop 100 megawatts of solar power on 300 public buildings and 250 megawatts on private properties in 10 years. De Blasio joined the recent People’s Climate March and laid out an ambitious plan to reduce the city’s greenhouse gas emissions by 80 percent from 2005 levels by 2050. The solar panel installations will triple the amount of energy generated from the sun on city-owned buildings. The solar panels will generate 6.25 megawatts of clean, renewable electricity. The city will commit $23 million with another $5 million for the installations coming from state grants under Governor Andrew Cuomo’s NY-Sun Initiative. De Blasio made the announcement outside John F. Kennedy High School in the Bronx. The campus is one of nine city schools and 19 other city buildings with rooftop solar already installed. The solar panels generate five percent of the school’s total energy. 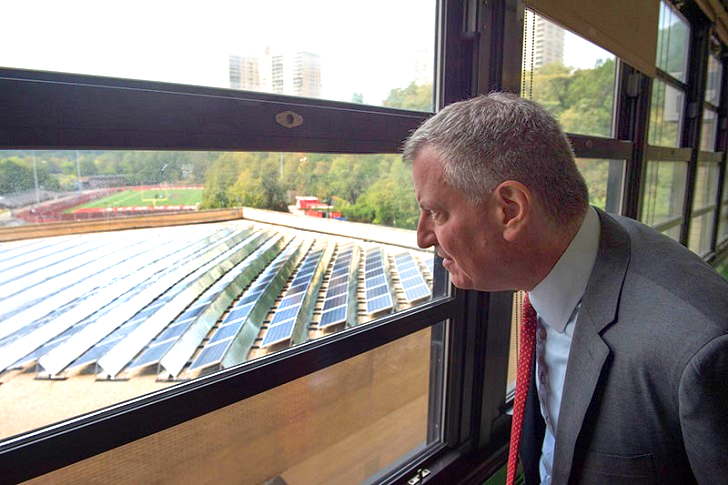 New York City Mayor Bill de Blasio recently announced a $23 million investment to install solar panels on 24 public schools by 2016 as part of his One City, Built to Last green building plan to develop 100 megawatts of solar power on 300 public buildings and 250 megawatts on private properties in 10 years. De Blasio joined the recent People's Climate March and laid out an ambitious plan to reduce the city's greenhouse gas emissions by 80 percent from 2005 levels by 2050.